Product prices and availability are accurate as of 2019-04-17 03:32:07 UTC and are subject to change. Any price and availability information displayed on http://www.amazon.com/ at the time of purchase will apply to the purchase of this product. 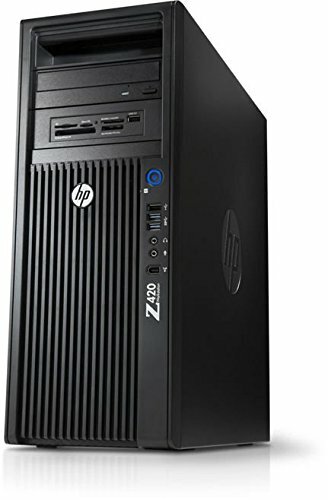 The HP Z420 is a full-featured, high-performance workstation in a compact, fully scalable space-saving design. Advanced memory and graphics options, and supports performance enhancing RAID configurations. Independent Software Vendor (ISV) certification delivers optimized compatibility with your critical software, and HP's use of industry standard architecture ensures that performance comes with reduced complexity. (*New*) 1TB Solid State Drive with 4. Year Warranty from Manufacturer +(*New*) 4TB Hard Drive with 3 Year Warranty from Manufacturer. What's in The Box? HP Z420 Workstation with Power Cable, New USB Keyboard & Mouse. 6. Front I/O: 1 USB 2.0, 2 USB 3.0, 1 Headphone, 1 Microphone; 600 Watt Power Supply; 6 Internal USB 2.0 Ports; 6 SATA Ports. Software Installed? New Installation of Windows 10 Pro 64-bit.